One serving size is equal to 2.25 oz. The warm, comforting taste of oatmeal makes for a sweet and satisfying breakfast or light snack. Serve your guests delicious flavors intended to impress with this natural maple brown sugar oatmeal. 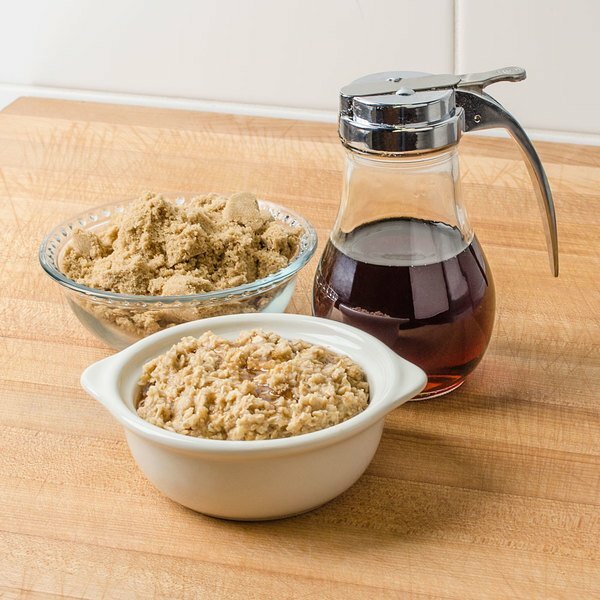 This oatmeal combines maple with rich brown sugar for a familiar, homemade flavor your customers are sure to love, while adding just the right amount of sweetness. The blended, soft consistency of oatmeal tastes great when served alongside light fruit or crispy toast. Perfect for your hotel's or bed and breakfast's self-serve breakfast display, provide add-ons, such as raisins, shaved almonds, and berries, next to the oatmeal for customers to enhance its wholesome taste and nutritional value. 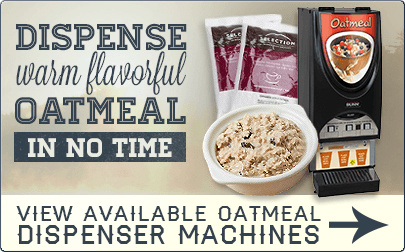 Designed for use in an oatmeal dispenser machine, this easy-to-make oatmeal delivers a consistent product each and every time. Simply follow the instructions on your oatmeal dispenser machine to properly prepare. Or, simply add 1/2 cup of boiling water to 1/2 cup of oatmeal, stir, cover, and let it stand for 60 seconds prior to serving. Heat the water either by stove top, or by microwaving for 40-60 seconds. For a richer taste, milk can be used as an alternative to water. Protein and iron-rich, jump start your health-conscious customer's day with hot, delicious, and flavorful oatmeal! Love the great price and quick preparation of this oatmeal. The maple brown sugar flavor is amazing and needs no additional sweetening. So yummy and delicious. A nicely priced oatmeal that tastes really great. The maple brown sugar is a great flavor combination and it is very simple to mix up and serve. Easy to mix and perfect for breakfast. Oatmeal is a staple in my family and this product is delicious! Very good price and big size. I got this maple brown sugar oatmeal for boy scouts to make on a camping trip. It was easy for the kids to make and it was great for feeding the whole group. We will be trying different flavors soon. We tried one bag of this Maple Brown Sugar Oatmeal, and knew we would have to buy more. This deal can not be outdone anywhere else. The oatmeal tastes great!